Two distinguished graduates of Samford University’s Cumberland School of Law and a longtime supporter of the law school will be recognized with special awards during annual alumni reunion activities April 8. Judge Julian Mann III of Raleigh, North Carolina, Class of 1974, was named 2017 Distinguished Alumnus; attorney R. Ashby Pate of Birmingham, Class of 2007, was named 2017 Young Alumnus; and attorney John D. Saxon of Birmingham was named 2017 Friend. The honorees will be presented their awards by Cumberland School of Law Dean Henry Strickland at the annual alumni reunion reception. Mann is currently in his seventh term as chief administrative law judge for the state of North Carolina. He is also director of the North Carolina Office of Administrative Hearings. In this role, he is responsible for appointing the codifier of rules for North Carolina and the state’s 10 administrative law judges. Previously, Mann was in private litigation practice with Gulley & Green (1974–78), and added a variety of business law and estate services after forming Green & Mann (1978–89). More recently, Mann was appointed to the North Carolina Commission on the Administration of Law and Justice. He is a Foundation Life Member of the National Association of the Administrative Law Judiciary and currently an active Fellow of the American Bar Association. Pate, a member of Lightfoot Franklin White LLC, served formerly as senior court counsel to the chief justice of the Supreme Court of the Republic of Palau, where he helped design the island nation’s first jury trial system. He then entered private practice with Lightfoot, serving for three years before being appointed an associate justice of the Supreme Court of Palau. In 2016, Pate returned to Birmingham where he focuses on international disputes, appellate practice, and commercial and medical litigation for Lightfoot. He is one of 50 distinguished lawyers and judges in Alabama serving on the American Law Institute. He is known for his recent speech, “Be the Light,” that stresses the importance of the human connection in the practice of law. 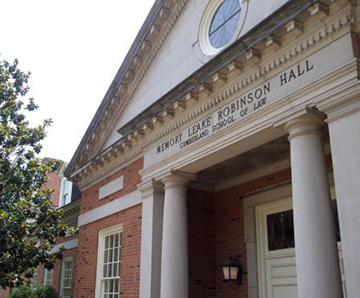 Saxon was honored in his role as an attorney, not a graduate of Cumberland School of Law, who contributes time and talent to enhance the quality of the law school. He has served as cochairman of school’s Employment Law Continuing Education planning committee for 20 years, assisting the CLE department in scheduling speakers on timely topics. He also acts as co-moderator of the employment law program and serves as a CLE speaker. Saxon began his legal career with the firm of Sirote & Permutt. In 1978, he was named a White House Fellow and served as special assistant to Vice President Walter Mondale. He was counsel to the subcommittee of the U.S. Senate Judiciary Committee and counsel to the U.S. Senate Select Committee on Ethics. Saxon later served in private practice , building a reputation as a “Super Lawyer” in the field of employment law. He also completed requirements to become a Fellow of the American College of Trial Lawyers.